It sounds as though we're continually banging on the same ol' drum, but we're convinced: the high-performance, small-form-factor PC is finally making sense. 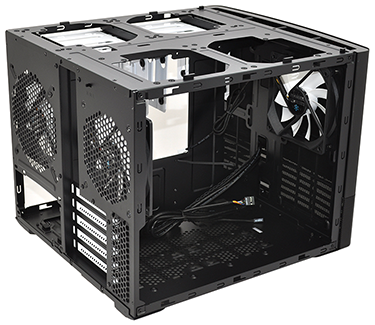 Sure, giant enclosures and full-size ATX motherboards are going to continue serving the enthusiast crowd for some time to come, however manufacturers are starting to see greater success in areas of the market that were once considered niche. Mini- and micro-ATX motherboards are on the up, and with accompanying components demonstrating excellent levels of efficiency, the time is right for high-performance gaming rigs to be downsized. Chassis manufacturers need to be at the heart of this transition and Fractal Design is fully onboard with the newly-released Node 804, priced at £80. Fractal's Node product line is well-known for its compact, living-room-friendly designs - the 605 and 304 are both testament to that - yet the 804 is a somewhat different beast in that it straddles the line between compact and powerful. Measuring 344mm (W) x 307mm (H) x 389mm (D) in size, this is the Scandinavian manufacturer's take on the cube form factor, which has seen something of a renaissance in recent months. Corsair's Carbide Series Air 540 is a prime example, yet Fractal has arguably gone one better by eschewing ATX motherboard support to enable a smaller footprint. 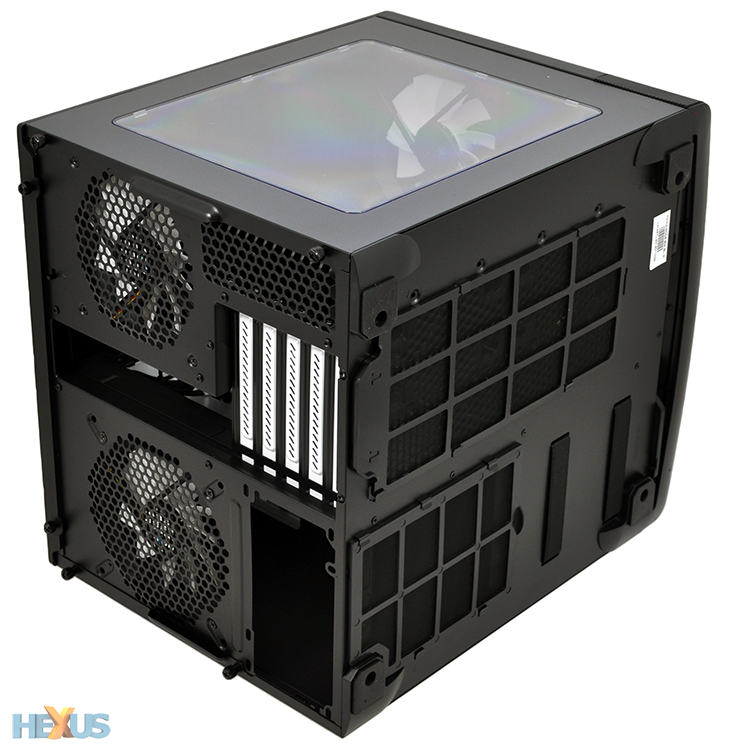 The Node 304 only allows for a mini-ITX or micro-ATX board, but the advantage of that is literally clear to see: this cube is a noticeable 151mm shorter than Corsair's, making it a tad more versatile in terms of deployment. Fractal's chassis still has some bulk about it, though, so whether or not you'd want to keep it on top of a desk remains a question mark. We've lived with it alongside a 27in monitor for the best part of a week and it's just about manageable. 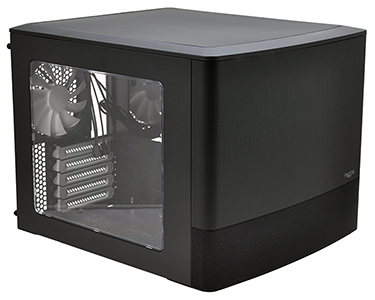 Designed in simple black, with signature white highlights inside, the Node 304 is elegant for a high-performance enclosure. The top mesh panel is neatly integrated, the subtle curve of the brushed-aluminium front is a nice touch, and the windowed side panel works well, too. This is a good-looking cube, and the only obvious drawback we can think of is a matter of preference: we aren't too keen on having I/O ports tucked around the side, as is the case here, and we'd much prefer a front-facing power button. Instead, Fractal has the power switch, two USB 3.0 ports, audio jacks and an optical slot all lined up on the chassis' right side. Interesting to note, also, there's no reset button, which seems a strange omission. I/O port positioning aside, it's clear from the offset that the Node 304 has been designed with high-end gear in mind. 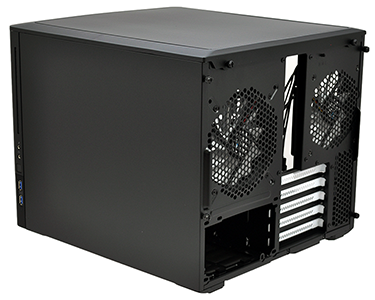 The front cover has a tidy-looking mesh section at its base to help aid airflow, five expansion slots around back allow for two-way discrete graphics, mesh filters line the front, top and back, and according to the specification sheet, this unassuming box can house up to 10 fans or four radiators. No shortage of potential, it seems. Both sides and the top can be removed by undoing half-a-dozen thumbscrews - sorry, there are no fancy push-to-release mechanisms here - but get inside and you see a clever use of space. Fractal has essentially split the cube into two chambers, where the right side houses the motherboard and onboard components, and the left side takes into account the power supply and storage. 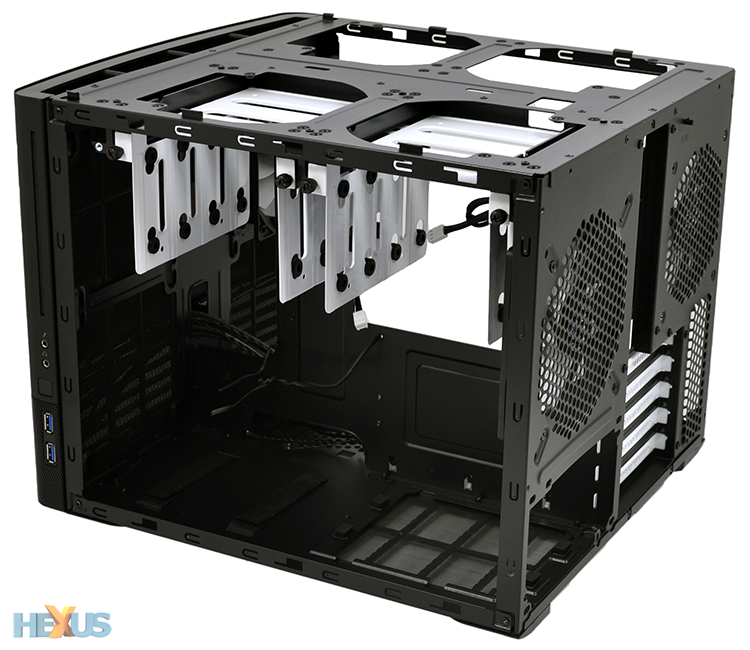 The steel frame feels sturdy enough, and though the plastic accents don't ooze sophistication, we've no real qualms regarding build quality. 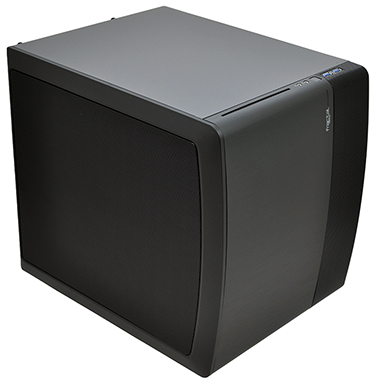 We're intrigued by the concept, however we do wish the 804 had been introduced as part of the Define Series - sound-dampening materials on the body of this cube would perhaps have been the icing on the cake.